Thank you for your interest in Dynasty by the paintbrush manufacturer FM Brush Co., Ltd. We are proud to offer our customers specialty paintbrushes to help them achieve their artistic goals. Our paintbrushes come in a vast array of shapes, sizes, and prices, to ensure you find exactly what you are looking for to help you create your masterpiece. Whether you are seeking watercolor brushes, texturizing brushes, or base coating brushes, our tools will help you work on all mediums. If you have questions or requests regarding our fine art paintbrushes, we encourage you to contact us by filling out the form on this page or by emailing us at info@dynastybrush.com. We strive to provide an exceptional customer experience every time and would love the opportunity to assist you in your needs. For service inquiries, please email us at customer_service@fmbrush.com. For dealer information on the new Dynasty catalog, view our Catalog page. For service inquiries please email us at: customer_service@fmbrush.com. 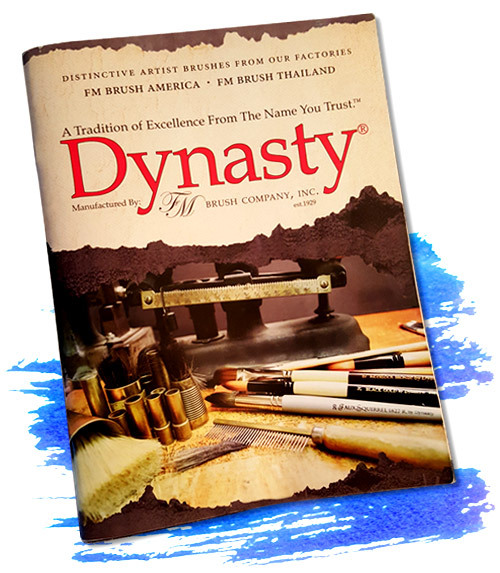 For Dealer information on the new Dynasty catalog, visit our Catalog Page.